← Around this home…there are single lady cat pictures. Yesterday I guest posted over at Culture Keeper to talk about one of my very favorite things, macarons. Ok, so really I am blogging about globalization and the indefinable qualities of culture inherent in regional foods, but the macaron is impetus for these reflections. I promise that there are pictures! Head over here and check it out. (Update: I am reposting the article below.) If you look at a macaron, you don’t see much. It’s a tiny cookie, unassuming in its size and structure. Just two wafers with a slight layer of filling. Little adornment, save the occasional dusting of cocoa powder or the dash of something shimmery. The color and flavor alone distinguishes it. Crimson, silver, canary, chartreuse, pale pink, cobalt black, and pure white cookies bear the names of rose blossom, plum, mimosa, lavender, and raspberry. The experience of the macaron is thus twofold, something you savor with your eyes before you taste it with your lips. Yet even as I frequent the Sweet Lobby to get my fix, I can’t help but feel that something’s been lost. I feel the same way I did when I found my beloved Speculoos spread in Safeway, or when Nutella became commonplace stateside. We no longer live in a world where cuisine is part of the regional landscape. Globalization means you can have the flavors of the world in your diet without ever leaving your home. On one hand, this is great. I love that I can indulge in mu love for British candy or Italian cookies in-between trips overseas that are few and far between. 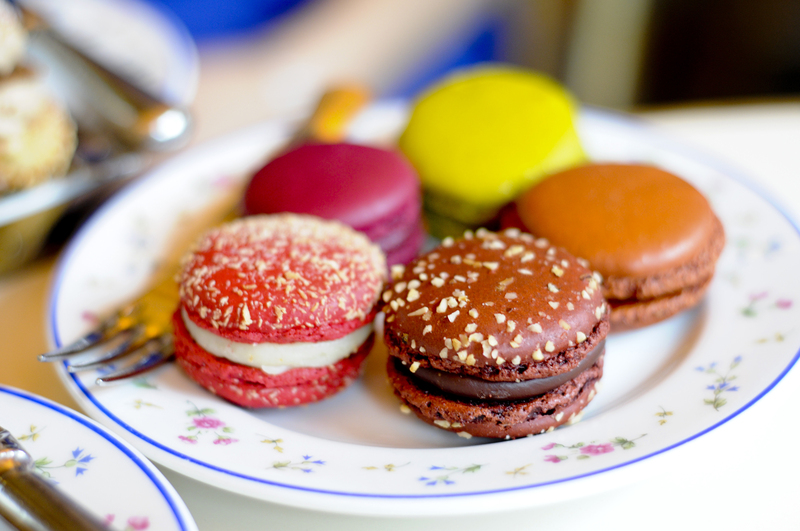 This entry was posted in Uncategorized and tagged dessert, food, macarons, Paris, travel. Bookmark the permalink.